The two twins, Lemon Pop and Lime Spritz, both had lived fancy lives in Manhattan with fame and fortune. 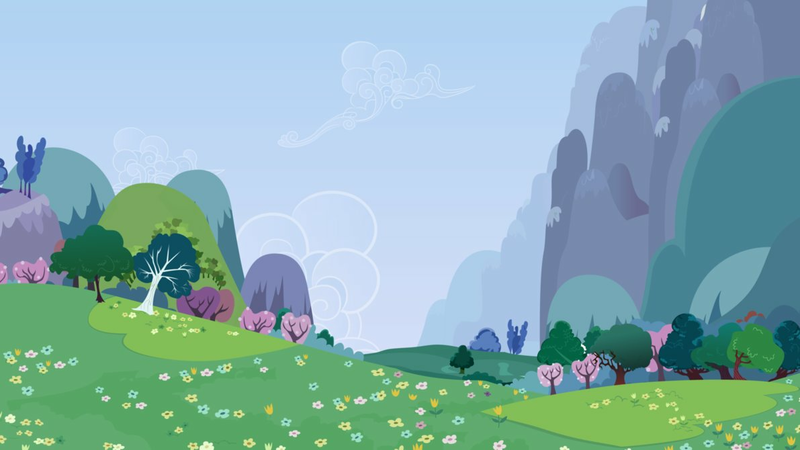 But, unfortunately, Lime's own adventurous spirit made it so that they were to live in Ponyville for the time-being. Lemon, who had opposed the idea, was grumpily tagging along, unwilling to speak with anypony from the moment they boarded the train to the moment they had gotten to the barn's entrance. The green citrus sister however, was thinking otherwise. Eyes shining and spirits raised from excitement, she exclaimed, "Lemon, isn't this absolutely exciting?! I can't wait to meet our cousin's cousin's cousin's cousin's cous---" A hoof covering her mouth, Lemon with an annoyed expression simply replied, "I get it. You're looking forward to this." A sigh followed before Lime gave a shout of, "Hello, is anypony there?!" Applebloom paused as she stared up at the tree above her, having decided to work on harvesting the apples by herself while her siblings were busy. Normally they always worked together, but she wanted to see how many apples she could get done by her own. She spun around and kicked out with her hooves, having them hit the tree with such force, the apples tumbled from the leaves and into the baskets around it. "Ah, how did ya like 'hem apples?" she said with a snort, staring at the tree. When Lime's voice rang out, she jumped a bit, turning her head around. Wha...? Then she remembered her sister faintly telling her about some visitors they were going to get in the next few days; but truthfully Applebloom had been so excited about what she was going to be doing with Scootaloo and Sweetie Bell, she had toned most of it out. She trotted away from the trees and toward the front of the farm, smiling widely as she saw the two ponies. "Why, howdy there!" she said as she reached them, coming to a stop. "Ya must be...Lemon and Lime!" she said, recalling the names that Applejack had told her a few days before. "Nice to meet ya." Removing her hoof from Lime's mouth, who either way wound up being able to shout loud enough despite being muffled, Lemon looked at the new pony who had appeared from a bit away from the farm and now at the entrance. Turning away immediately with a slight glare from the corner of her eyes, the unicorn quite frankly, didn't share the same feeling of happiness that Lime. On the other hand, the pegasus greeted Applebloom with the same excitement, "Hey! Nice to meet you too, I'm Lime and my grumpy sister would be Lemon. She hasn't tried to actually talk to anyone on the way here besides me, so I don't think she'll be trying to greet you. Oh, and you're Applebloom, right?" Her wings flapping rapidly but not taking off as she hopped about in the same place, Lemon's horn glowed a warm yellow that was darker than her own coat, restricting her twin sister from flying. "Make an attempt to keep yourself from going hyper at least." "Naw, it is alright. We are used to hyper ponies; my sister is friends with the most hyper pony here in Ponyville," Applebloom said with a chuckle, before nodding. "But yea, I'm Applebloom." She turned and led them into the farm, heading a way in before she stopped and glanced at them. "Ah, forgive me, but I kinda zoned out when my sister was talking 'bout ya two coming. Why exactly are ya two staying with us?" The twins simply glanced at each other for a few brief moments before following the earth pony to the farm, though Lime simply caught her eye at the part about 'most hyper pony'. Lemon, who realized this, simply turned her face, glaring in a different direction, knowing what would most likely happen next. "Most HYPER pony? Oh, oh, oh! Wouldn't that be Pinkie Pie? Oh, yes, most definitely!" Her wings had started flapping so hard, that the Pegasus had lifted herself off the ground, and was zipping in circles around the two, only to be blown off by a strong breeze, crashing herself into a tree. "Oww... The 'lemon' twin just let out an annoyed humph, her horn glowing again as it surrounded Lime in the same color, bringing her sister back next to her. "Thanks! Oh, we're here because I decided to find out what a simple life is like outside of Manhattan! And, I dragged Lemon along with me." "Yup, it is Pinkie Pie," Applebloom hummed, raising an eyebrow at them. She watched as Lime went rolling into a tree, and couldn't help but chuckle. It reminded her of Scootaloo; who was always getting hurt. The moment Lime was back with the group, she smiled softly. "Surprise ya folks from Manehatten know about Pinkie Pie; my sister told me that the Manehattens were all stuck-up like when she went there to live with Aunt Orange when she was a filly. Figured they would try to not care about a pony all about parties, but suppose times are changing thought." She paused, glancing from Lime to Lemon. "If ya are planning to stay here thought, ya must know that we are expecting ya to work hard. We do always need a few extra hooves around. OOC: Q^Q I'm so sorry for the late reply! IC: Lemon simply glared at Applebloom. How dare such a pony think that every Manehattenian (idk) was stuck-up! What was she neighing about? Not like such a farm pony knew anything about ponies there. Stereotype much? Or was it segregation? Hearing the part about having to work though, instantly made her scowl even more than she already felt. Like she would bother working with some farm folk! Lime on the other hand, well... the opposite of her sister of all things, was immediately excited and hopping around again, repeatedly asking with an energetic tone, "Oh, oh! When can we start? When can we start?" The Pegasus was flapping her wings rapidly, but took care not to lift herself from the ground this time around. "Can we plant limes and lemons for our weekly lemonade stand? It's a little thing Lemon came up with! And it's really fun, too!" "Lime... I don't want t---"
"Of course we're doing it, what am I thinking? Silly me!" Applebloom paused as she glanced at Lemon and Lime, watching Lime hop around in all of her excitement. "I suppose we will have to talk to my sis' about when ya can start and 'bout planting those limes and lemons." However, Applebloom didn't fail to notice the glare that Lemon had given her, and sighed slightly as she stared at the unicorn. She was skilled at seeing the truth in things; maybe something she had gotten from Applejack. "Listen, I'm sorry if I made ya mad with the whole 'stuck-up' things. I'm just telling ya when I heard from my sister. Suppose that maybe the ponies that just Aunt Orange hung out with could of been the most stuck-up of Manehatten, but Applejack never got to know much more ponies then them before she came back home." With that, Applebloom turned and led the two back toward the house, hoping that Applejack could led a hoof with these two; Lime had just to much energy for her, and she wasn't sure what to do with Lemon's mood. She didn't want to be rude but Lemon seemed to be in a rather foul mood. OOC: I'm sooo sorry this is late! >^<"" I hope Echo/Lunar said that I was busy? IC: Lime simply puffed her cheeks, letting go of the air she collected with a quick whiff. Sighing, the Pegasus only said, "Guess it can't be helped then! We'll just ask... Applejack? Right, Applejack! If we could get with the lemons and limes~ These seeds CAN't go to waste without being used!" Lemon on the other hand, still particularly foul indeed, only gave an annoyed 'humph' and simply ignored Applebloom's explanation. If a mare was to judge an entire city that way based on the experience of just one who met only few, the unicorn did not wish to partake in any of it at all! Resisting the urge to dash off, Lemon simply followed along with Lime, the Pegasus now hopping up the road in a very pleased mood as she hummed a little tune with the birds. As Applebloom and the two Manehattans reached the house, the yellow mare motioned for them to wait a few seconds as she opened up the door to the house and poked her head in. "APPLEJACK," she yelled at the top of her voice. "LEMON AND LIME ARE HERE!" A few moments later, an orange mare appeared at the entrance of the door, raising an eyebrow as she stared at her little sister and the two new guests. "Well, howdy you two. Nice to see ya got here safe and sound. Ya can call me Applejack, or AJ I suppose; most of my friends do." She trotted out of the house, grinning as she reached up to the brown stetson that rested on her head, and dipped it slightly as she stared at them. "We got the guest room all nice and tidy for ya, but do ya have any questions first about your stay?"